Would you like to create default slider settings for your image dimensions? This is very simple to do and can be done with a few clicks of your mouse. We’ll walk you through how to create default slider settings. Take a look at our Default Addon documentation for installing, activating and configuring your Default Slider Settings. Once the addon is activated, you’ll see a new slider called Soliloquy Default Settings. Just edit this slider to configure your default settings. The available tabs that show will vary depending on the addons you have installed. You can change the Image Dimensions on the Configuration tab. Finally just click Update or Publish to save these changes. 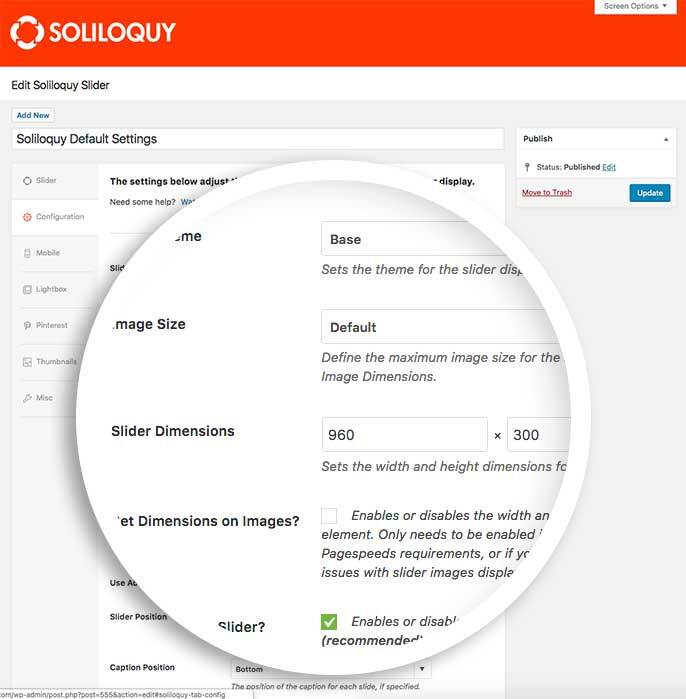 Now each time you create Add New on the Soliloquy slider, you’ll choose the Soliloquy Default Settings to use the default slider dimensions for all new sliders. And that’s it! You now have default slider dimensions to use for each new slider. Would you like to adjust the image quality when you upload images to WordPress? Have a look at our article on How to Adjust Image Quality.